"The President could see the incident and checked with us that all was ok". Footage from Skeans' camera, tweeted by O'Donoghue, suggested he and his equipment were knocked off balance for around 10 seconds, as he was filming Trump's speech. Gary O'Donoghue, BBC's Washington correspondent, who also was there, said that the man had jumped onto the media platform and tried to smash the BBC camera. The alleged assailant is shown shouting: "F- the media". "I didn't know what was going on", Skeans told the BBC, describing the push as a "very hard shove". Swalwell first introduced the Journalist Protection Act in February 2018, which he said aims to protect "journalists in every corner of our country if they are attacked physically while doing their job". Danahar said he sent the security review request to White House spokesperson Sarah Huckabee Sanders, though Monday night's rally was a campaign event, not an official White House event. "The White House Correspondent's Association condemns the physical attack on our colleague at the president's rally in El Paso, Texas", reads a statement from WHCA President Olivier Knox. Trump has frequently attacked the news media for what he views as unfair coverage, decrying some outlets as peddlers of "fake news" and "enemy of the people". According to the magazine, the El Paso police department is was "still gathering" information regarding the incident. 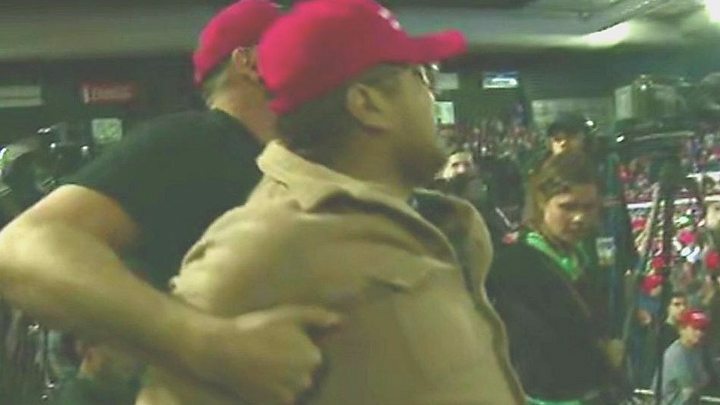 Members of the media oftentimes are faced with harsh rhetoric at Trump rallies, but it's rare that things escalate this far.